"It's hard because you want to invite people who mean something to you and are special to you, so we have been going through who we want to invite and who we want to share that moment with," Jenna told Entertainment Tonight when they were tasting cakes at a shop in Santa Monica, CA. Jenna and Val are therefore reportedly still finalizing the guest list for their upcoming wedding. Back in December 2018, the couple revealed they wanted to have an "intimate" wedding with about 200 guests. But as Jenna and Val are getting down to the wire, it seems reaching goal might be a stretch. "We're still making eliminations, so TBD," Jenna joked. "It's a double-elimination tomorrow," Val quipped, referencing Dancing with the Stars' format. Val told ET that he and Jenna would like to "keep a small guest list," but at the same time, "it's a beautiful thing that we've built real sincere, genuine relationships." Val continued, "And the number grows, but it doesn't from like a shallow standpoint of having everybody there that we know. It's growing because we realize, 'Wow! There's a lot of people that mean a lot to us in our life.'" The guest list, however, will definitely include some famous faces, including Val's former celebrity dance partners: Season 23 winner Laurie Hernandez, Season 20 winner Rumer Willis, and Season 24 finalist Normani Kordei. As for Jenna, she invited Bachelor in Paradise's Joe Amabile and his girlfriend Kendall Long, as well as Dancing with the Stars: Athletes winner Adam Rippon, who is reportedly going to serve as a "brides-man." To even things up, Val is reportedly going to have dancer and wedding planner Nicole Volynets serve as a "grooms-lady" to walk down the aisle with Adam. Jenna shared the best of her bridesmaids will be her sisters and close friends, So You Think You Can Dance Season 12 winner Gaby Diaz, and fellow Dancing with the Stars pro Lindsay Arnold, according to ET. And Val disclosed his groomsmen will be comprised of longtime family friends whom he's known for at least 25 years, and as expected, his big brother Maksim Chmerkovskiy will stand by him on the altar as his best man. Val noted Maksim is "very excited" about his role. Maksim and Peta Murgatroyd's son Shai will also make an appearance during the ceremony along with Jenna's nieces. The soon-to-be bride and groom, however, told ET they probably won't be able to include their adorable dog Ziggy in their nuptials. "I don't know if he's trained enough," Jenna admitted with a laugh. "He just has a mind of his own, so I'm not sure that commanding him to come down the aisle [would work]. I think he'd be way too interested in biting things and eating the plants and running around crazy." Val, 32, proposed marriage to Jenna in June 2018 in Venice, Italy, after dating on and off for two years. The So You Think You Can Dance alum told Us in September 2018 that wedding planning with Val has been "such a fun chapter" of their lives together. 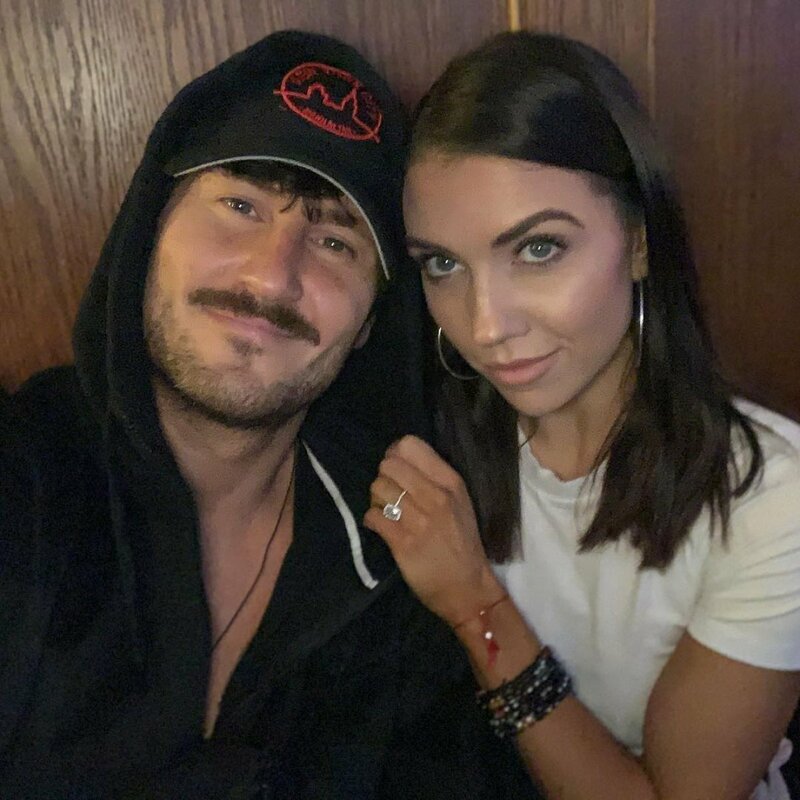 Jenna and Val began dating in 2015, but they split the following year. Val then dated former DWTS contestant Amber Rose from September 2016 to February 2017. Jenna and the two-time mirrorball trophy champion rekindled their romance and went public with their love later that year. Rumors Val and Jenna got back together sparked in June 2017 when they were spotted vacationing in Europe together. The pair then exchanged a passionate kiss on the Season 25 finale of Dancing with the Stars and they've seemingly been inseparable ever since.